I married my high school sweet heart, Jeff, he’s the love of my life and I couldn’t imagine life without him! We have been together for twenty years this October and married for ten! We have 3 small children who are the light of our lives! We have 7 year old identical twins boys who are energetic, super sweet, loving and sports centered, and our newly adopted 4 month old little girl who’s personality and sweetness is shining through more and more every day! I feel overly blessed to have this amazing family!!! As a family we love to travel, go out to dinner, and play sports! Spending time with my family is my number one priority. About four years ago I contracted Botulism. Botulism is caused by the neurotoxin Clostridium botulinum. Unfortunately I contracted botulism from botox injections. My doctor was Board Certified and trains other doctors on how to inject the toxin. I don’t want to get into the details too much, but there is a reason they advertise the injection’s with such long disclosure. I wish I was fully aware of the dangers before doing something that has so profoundly affected my life. Five days after my injections, I found myself in the ER having trouble breathing, swallowing and heart arrhythmia. It took me 12 months for those symptoms to subside and then once I started to feel better, a whole different set of health issues arose, thyroid troubles, extreme food allergies, parasites, intestinal infections, migraines, asthma, brain fog, digestion issues, hair loss, weight gain, insomnia, extreme fatigue…etc. Most of these issues are a result of my body being in such a high state of physical stress from being sick so long and my immune system being strained. I’ve spent countless hours in and out of Doctors offices, hospitals and sleepless nights crying and searching for answers to fix myself. I’ve tried many different therapies and drugs all of which seemed to make things worse or the side effects weren’t worth it. Which brought me to where I am today….About two years ago I started researching and reading about autoimmunity and naturopathic health(although I hadn’t been diagnosed to have an autoimmune disease, my symptoms were autoimmune in nature). I dove right in, as it made sense to think and care for the body as a whole and not just treat one failing part. I read and I read and I read and I read and I read and I’m still reading! I started working with some amazing functional doctors that helped me put my puzzle pieces together. I love this lifestyle so much that I decided to go back to school and get certified in Holistic care! I’m happy to report that today I’m not on a single drug and I manage all of my symptoms with diet and lifestyle. This blog is so important to me because I’ve relied on so many other bloggers and their journeys working towards health and wellness. I hope and pray I can do the same for others! 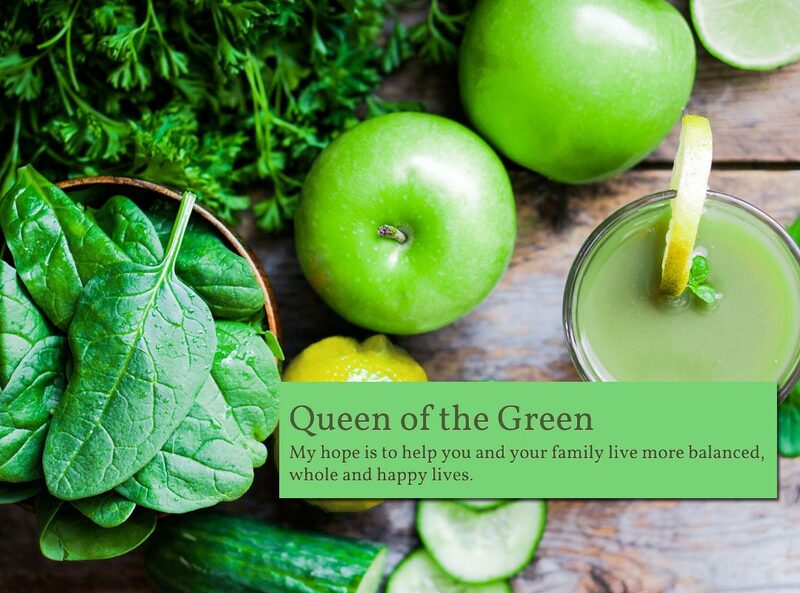 Queen of the Green is all about my Love of holistic living, achieving health in a toxic world, and balancing your body and home in this crazy stressful life. Next: Next post: What is Holistic Health Coaching?